For New Delhi and Beijing, it has been difficult to play a role of balance in the Crimean crisis, particularly as the matter is directly concerned with their ally Russia. Rising powers India and China have strong ties with Russia and are also members of groupings like RIC and BRICS, in which Russia is a key player. It is but natural that how these countries perceive the developments in Ukraine will matter to international community. The top officials from both the countries have so far treaded a cautious path. For these two countries, it has been difficult to play a role of balance particularly as the matter is directly concerned with Russia. As the conflict in Crimea unfolded, India’s National Security Advisor, Shiv Shankar Menon observed, “We are watching what is happening in Ukraine with concern... The broader issues of reconciling various interests involved and there are, after all, legitimate Russian and other interests involved and we hope those are discussed, negotiated and there is a satisfactory resolution to them”. India’s External Affairs Ministry, however, adopted a more moderate approach and called for a “sincere and sustained diplomatic efforts to ensure that issues between Ukraine and its neighbouring countries are resolved through constructive dialogue.” India is also concerned about instability in Ukraine as there are about 5000 Indians in Ukraine, among which most are students. Any instability and violence is a matter of concern for India. China has opposed the idea of imposition of sanctions against Russia in the context of Ukraine. Chinese foreign ministry spokesperson Qin Gang stated, “China has consistently opposed the easy use of sanctions in international relations, or using sanctions as a threat.” China at present is the largest trading partner of Ukraine. But at the same time it will not be interested to offset its relations with one of its largest trading and strategic partners, Russia. Chinese policy makers, hence, called for peaceful solution to the conflict. Chinese President Xi Jinping told Russian President Vladimir Putin, “China believes that Russia can coordinate with other parties to push for the political settlement of the issue so as to safeguard regional and world peace and stability. China supports proposals and mediation efforts of the international community that are conducive to reduction of tension”. As allies, India and China would not prefer to see Russia’s interests hampered in the current crisis. Nor would they prefer Ukraine turning into a conflict hotspot, and a ground for extremism. India and Russia enjoy a strategic partnership, and similarly China’s relationship with Russia is special. Russia is India’s largest source of arms and ammunition, and they are involved in many joint projects. India-Russia relations despite many ups and downs have been cordial and particularly after the signing of the strategic partnership document in 2000, the relations have been on the rise. Similarly, Russia-China relations have grown significantly in recent years. President Xi of China watched the inaugural ceremony of Sochi Olympics last month and displayed solidarity with his Russian counterpart. Ukraine’s descent into chaos is in nobody’s interest, neither for Russia, India or China, not even for the West. The Viktor Yanukovich government had reached an agreement with the opposition last month. Under that agreement the government had conceded almost all demands of opposition including amnesty to all protestors, dilution of presidential of power and early elections. The agreement was brokered by the foreign ministers of Germany, France and Poland. But within a few days the government was overthrown. Much is yet unclear about how he was deposed despite the agreement. President Putin and the US President Barack Obama have several rounds of talks over phone on the Ukrainian crisis; the differences have starkly come out. Russian President has pointed out Russia’s interests in Ukraine. Particularly the Russian population in Ukraine is a factor in Russia’s policy making towards Ukraine. It needs mention that a significant percentage of Ukraine’s population comprises of ethnic Russians. The foreign minister of Russia and the US Secretary of State too have held several rounds of discussions. They are meeting again on March 14 as a last effort to sort out differences through dialogue. Germany’s Chancellor, Angela Merkel’s idea of forming of Contact Group can be a useful idea to address the crisis. But the rapid development of events in Ukraine will likely impact this idea. 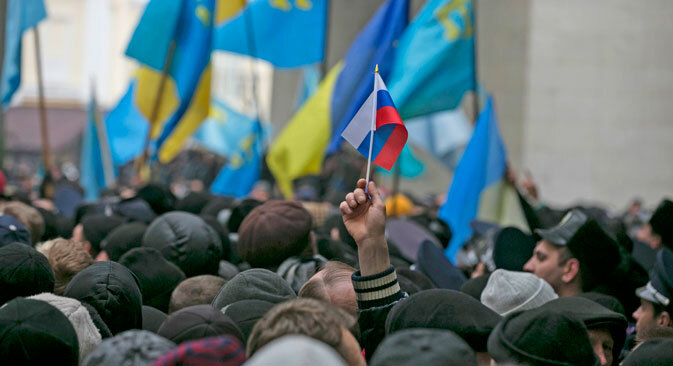 As the Crimean parliament declared its intention to be part of Russia, and is scheduled to hold a referendum on March 16 on this policy, the Ukraine situation has taken a new turn with prospect of a division of the country. India and China would not want Ukraine to become the setting of a new great game, or a violent conflict hotspot. They want a stable Ukraine where Russian interests are not hampered. All the concerned countries are multiethnic and pluralistic with a secular fabric. However, in case of Ukraine a rupture in its pluralistic structure has recently emerged. India and China can use their relations with Russia and play a constructive role in Ukraine. They have from the beginning emphasized that the only solution to the conflict is dialogue and deliberation. But for this all parties need to engage in dialogue and take into account interests of various players.